What if the transfer of money takes place in seconds? With full compliance of Know Your Customer (KYC) and Anti Money Laundering (AML)? This technology, currently being tested in the Philippines and Nigeria is coming to India soon. It has the potential of causing a tectonic shift in the way banking is done. What if the transfer of money takes place in seconds? At a fraction of the current transaction costs? 112. … The Government will explore the use of blockchain technology proactively for ushering in the digital economy. The blockchain is a proven technology whose uses are just getting discovered. And it can solve a big problem that developing countries face. Here is an idea whose time has come. What if the transfer of money takes place in seconds? At a fraction of the current transaction costs? With full compliance of Know Your Customer (KYC) and Anti Money Laundering (AML)? Does such a system exist? Small or Big, enabling access to money in a seamless, secure manner is what Liquineq AG (LQQ), a Swiss startup does. Its unique regulation compliant solution of Digital Cashier’s/Banker’s Draft and Digital Traveler’s Checks™ as payment means has huge potential to create upward mobility for tens if not hundreds of millions of people, as well as increase velocity for financial institutions. Because it is a Digital Cashier’s Check, it is automatically in compliance with the laws of most countries. As adoption increases, the need to have paper currency reduces significantly. Bye-bye counterfeit currency! No more Black money! The Government can gradually bring down the fiat currency notes and corruption will also go down with it. After all, it would be elementary to catch the bribee! Make payments and money transfers by sending a digital form of Cashier’s Check that is robust, secure and fast, with transactions across countries being done in a matter of seconds. No amount is too small, no sum too large – from local to international, payments and end-to-end money transfers can be transacted from one’s Smartphone, in the comfort of one’s home, 24 x 7. Now one can have one’s own branch of one’s bank in one’s pocket and track the progress of one’s payments, money transfers, investments, and loans! All transactions are recorded/ catalogued and stored away. By using Blockchain creatively, it is possible to minimize the need for heavy computing power. Multi-tiering the blockchain and allowing for creating sub-blocks so that the system is efficient. Figure 1 is an example of a multi-tiered blockchain setup. For most people, normal transactions occur within their community – you would pay your local grocer, milk vendor, the flower vendor, water bill etc. all of whom might be in the same community. 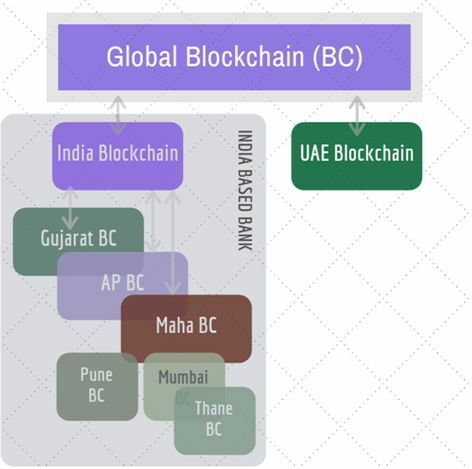 For instance, if a person lives in Thane, then most transactions would take place among members in the Thane blockchain, a sub-block of Mumbai blockchain, which in itself might be a sub-block of Maharashtra blockchain. By allowing multi-tiering, the transaction time can be lowered to just a few seconds. All records are kept and maintained for audit later. The technology works even in areas where network access is spotty. You will never need to carry your wallet (instead you will have a Digital Wallet in your Smartphone). Ashok works in Dubai, in an engineering firm. His extended family lives in Pune and he would like to fund the family expenses on a need-to basis. He can afford to do so, thanks to the new blockchain technology that has obscenely low transaction fees. No more bulk remittances at the beginning of the month. Alternatively, he could remit all of his salaries into his Indian Bank account and draw his expenses only when needed. Either way, all transactions are KYC/ AML compliant; it is as if Ashok has a bank in his Smartphone. For more, see Figure 2. 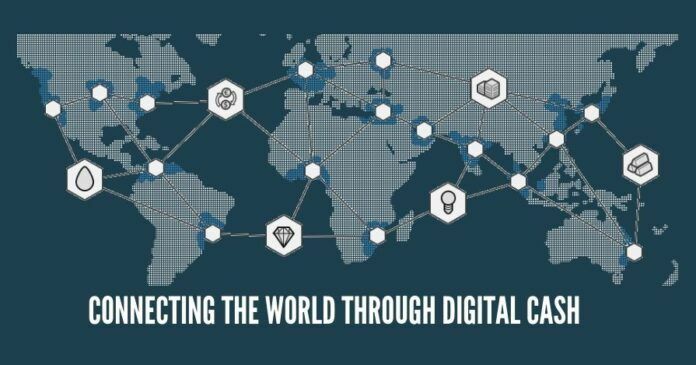 The India based bank has a country-wide blockchain that manages the country-to-country transaction. 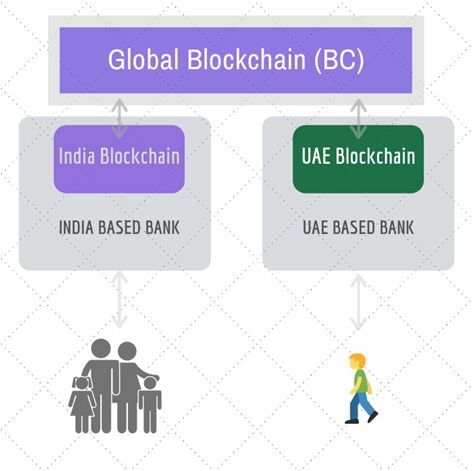 For an inter-country transaction (e. g. India to Dubai), the Indian Bank using India Blockchain would move through a Global Blockchain to the Dubai based bank (in turn using Dubai Blockchain). The transfer activity would be logged on all three blockchains (India, Dubai and Global). This technology, currently being tested in the Philippines and Nigeria is coming to India soon. It has the potential of causing a tectonic shift in the way banking is done. With this ambitious move, Liquineq will change the banking industry as we know it. Disclosure: Sree M. Iyer is part of Team Liquineq and is its Chief Solutions Officer. All economic pandits, Bankers should think of some fully secured card technology wherein all the cash, fixed deposits, land holdings, houses including all borrowings are recorded and used by simple swiping in digital machines within India and a separate card for international transactions of similar nature. The Government can distribute the swiping machines in India fixing a cost with some subsidy to all individuals. All transactions should be digital and no cash transactions even for buying some vegetables in the market should be possible. It should take care of our nations requirement and should be developed by our software professionals. Any payments or purchase of properties are by digital cards including Government tax payments. It can be connected to our Aadhaar Card for more security if possible. Cost of printing notes and cost of Cheque book printing and many banks may go out of business and cost effective.